The heat built fast in Roma. Ten days prior we were putting on our fleece jackets in the morning because it was cold in the apartment, but by the time my brother and sister-in-law arrived June 1, that was no longer a problem: it was getting warm. Luckily for us – if not for our cat sitters – we were leaving Roma. We also left behind the tourist hoards. 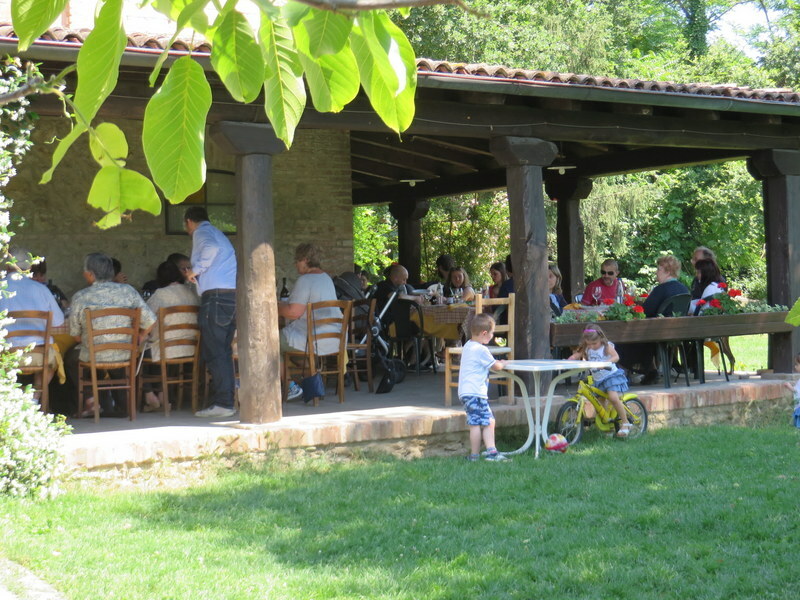 Lunch on the veranda at Corte d’Aibo is a family affair. Heading to Emilia-Romagna on June 2 (the Festival of the Republic which celebrates the election in 1946 when the monarchy was rejected in favor of a republic), we left behind the Roma tourists only to find throngs of Italians. At least they were at lunch when we arrived at Agriturismo Corte d’Aibo. But that was the holiday and the last day of the Italian four-day weekend. Continuing on to our mountain destination of Montese, we found ourselves the only tourists at the very pleasant Hotel Belvedere . This is not your average balsamico. This is Aceto Balsamico Tradizionale di Modena, another thing entirely. I found Hotel Belvedere and Corte d’Aibo thanks to Riccardo of Trekking Emilia-Romagna. Somehow my SIL Jane and I hit on going to E-R and hiking, and I was fortunate to stumble upon Riccardo’s company. 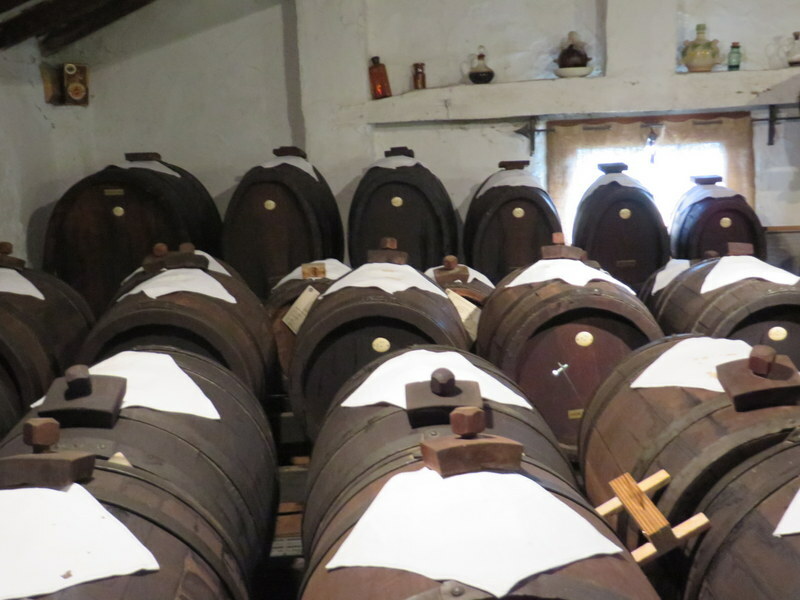 He put together a great itinerary for us including a tasting and tour at an acetaio called Ca’ dal Non, lunch at the agriturismo, and a guided hike through the mountains, which saw significant action in World War II. The arrangements also included our hotel, breakfasts and dinners. All we had to do was show up and sweat a little on the hike. 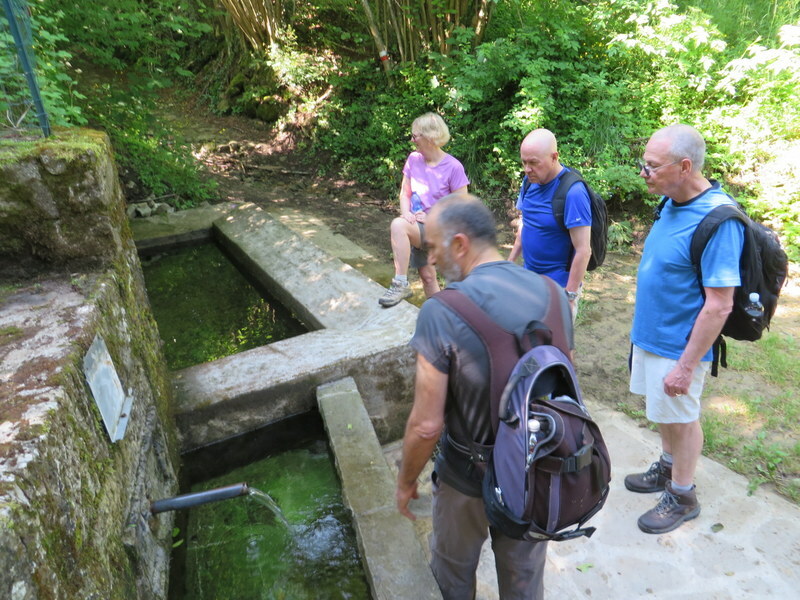 Stefano, foreground, explains a fountain in the mountains to Jane, Rick and Ric. Multiple basins allowed people to use one for drinking water, the next for washing, and a final one for watering livestock. During our hike, we learned about the flora, fauna and history of the area. The Gothic Line was here, a place where Germany was making a last stance in the north of Italy as the Allied Armies, having fought their way north through the boot, bombed the heck out of them, and unfortunately, also bombed the Italian villages. 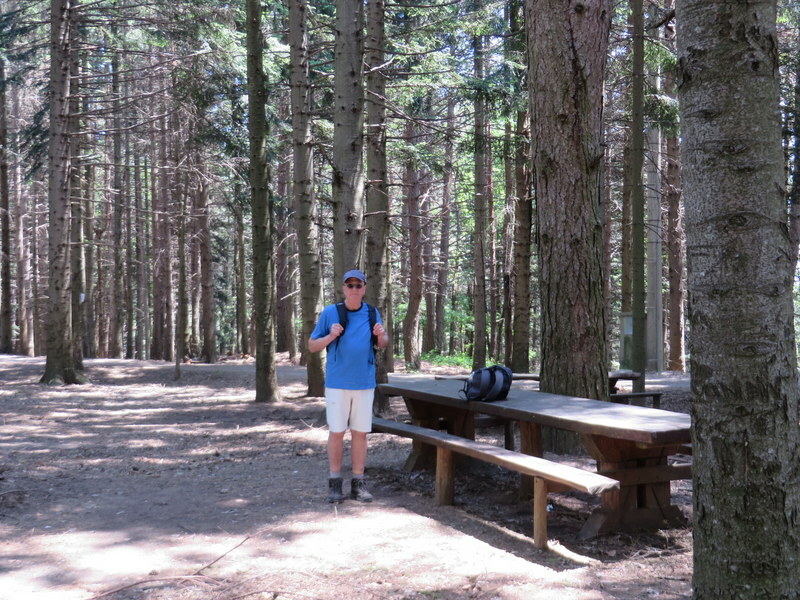 Ric in our woodsy picnic spot, an area frequented by families on Sundays. This one surrounded a church that commemorated the civilians killed in the area. Stefano, our guide, was a font of information and knew the area well, having grown up nearby in the famous cherry town of Vignola. He speaks excellent English having lived in the U.S. (He loves Seattle!) We lugged along Parmegiano-Reggiano, salume, bread, and fruit for a picnic, along with local Lambrusco and a homemade crostata, all supplied by the hotel. At the end of the trek, my pedometer wrongly said the hike was about 8 km, Stefano said 11, my brother estimated 12. It felt like 18. We were then treated to a tour of a caseificio or cheese factory at Dal Contadino. This was a multi-generational farm operation producing the famous parmigiano-reggiano as well as ricotta, marmalade, and more. It was fun to visit a typical small family operation and see the incredible labor that goes into making this cheese. The artigianale beers they served with the cheese really hit the spot after hiking. If you ever get a chance to drink White Dog Beer, do it. 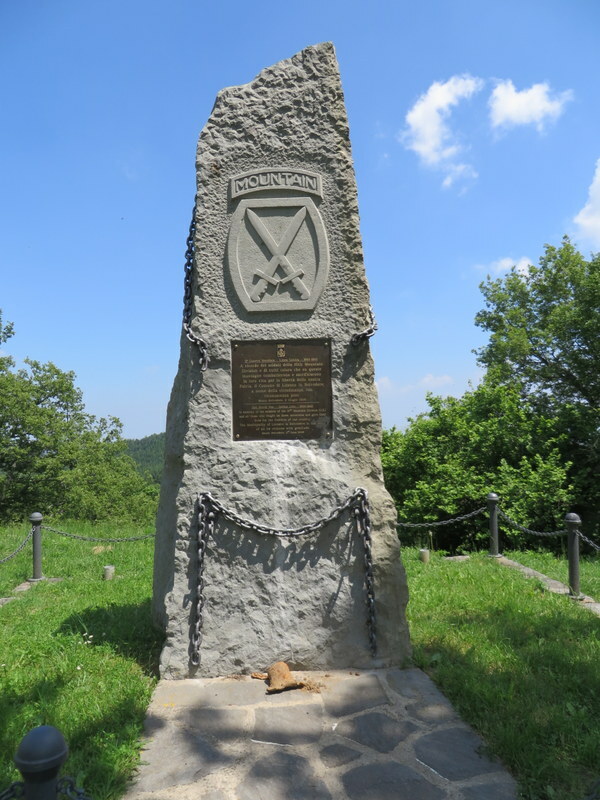 At the top of Mount Belvedere there is a monument honoring the 10th Mountain Division. I have to say that, whatever the length, the trek barely dented the calories we were consuming. The kind owners of Hotel Belvedere looked after us well. Clean, comfortable rooms with good showers, incredible food from classic pastas for primi to roasted rabbit, pork and steak for secondi. They were also experts in recommending local wines to complement their food and served some of the best grappa around. Compare this with an American town of 3400 people where your choice of wine with dinner might be beer. 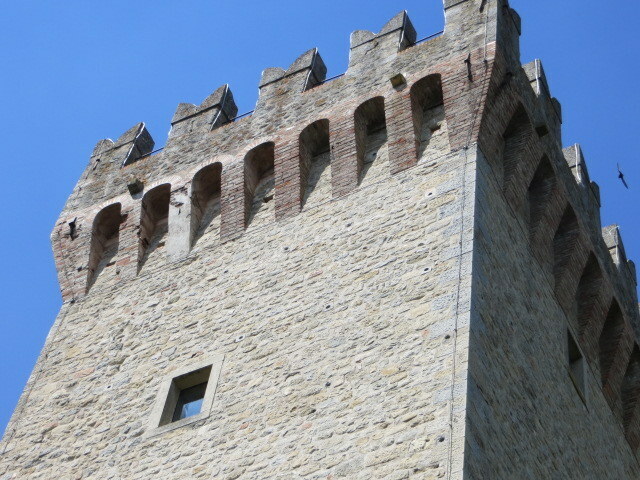 Montese has a castle dating back to the 13th century. This was not high tourist season. In fact, it seems only August gets pretty busy. Otherwise Montese is off the radar of folks headed to more famous destinations. Nearby one can visit the Ferrari Museum in Maranello, the town of Modena, and even Parma is within reach. After three nights we somewhat reluctantly said good-bye to Montese and the lovely folks at the hotel, as this was part one of a three-part trip. On to Lago di Garda! 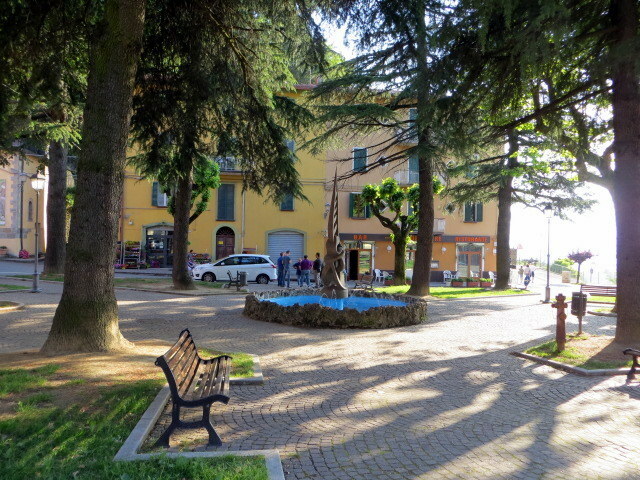 Piazza in Montese, in front of the Hotel Belvedere. 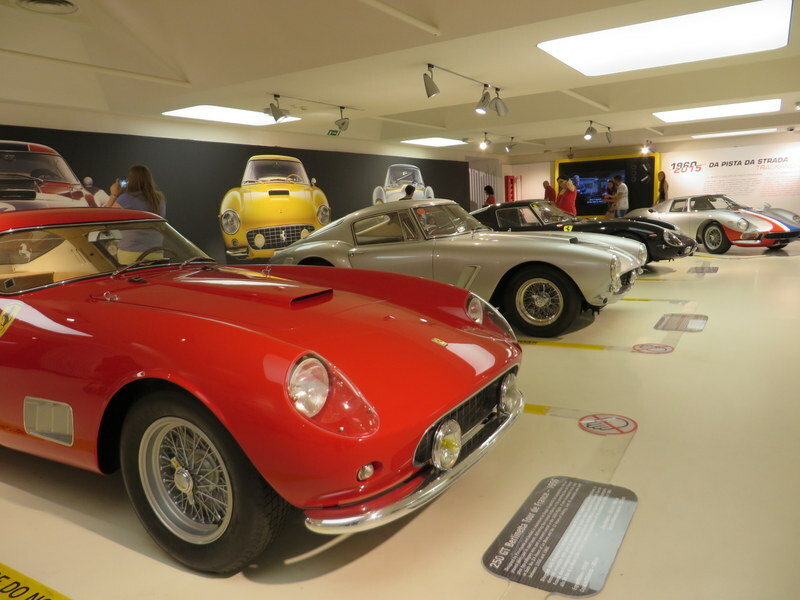 We took one day away from Montese to journey to Maranello and the Ferrari Museum. Quite a collection! Oh yay! I’m so glad you came to Emilia-Romagna! Looks like you had a great experience. Trekking ER is a great company; I’ve heard good things about them multiple times. Next time you’re near Reggio Emilia, let me know! We can grab a coffee and chit chat! Thanks M! I am sure we’ll be back next spring for areas further north such as Reggio and Parma. Riccardo Solmi was such a great resource, and the people so welcoming! Your perfect descriptions of hiking, great cheeses and breads paired with delicious and colorful wines ( not to mention the little hotel!) just make me think this is a movie you are starting in and not real! Keep up these wonderful descriptions. Dear Marcia, It is always a pleasure to read your remarks! You are very kind! There are boring moments in this movie, like washing clothes in the hotel sink. And annoying ones, like when my brother’s car went off the road when he swerved to avoid some cyclists and Hertz had trouble directing the tow truck to us so we waited in a mountain meadow for almost 4 hours…. It’s all interesting one way or another! It is always good to know how to “live in the moment”! This adventure sounds like a dream. But then, all of them sound that way. I have been a bit delinquent with my email. Now I’m looking forward to some of your other, unread, posts. Portland is having hot hot weather. Too many days in a row! I’m looking forward to seeing you in August! Hi Carolyn! Nice to hear from you as always. We are having fun. It is nice not to go to work. 🙂 What Portland calls hot we now call “nice.” I fear our bones have warmed up a bit living here! I agree with you about Portland weather. In the 90’s with low humidity is much more comfortable than other places with humidity. How wonderful, you travel like a local. Romagna is on our list to visit. I will keep notes where you had been, say hi to Jan and Rick. Hi Justice! Nice to hear from you! Hopefully we can meet when you are in Italy.